Belinda Hughes has worked in Australia’s beauty sector for nearly two decades. 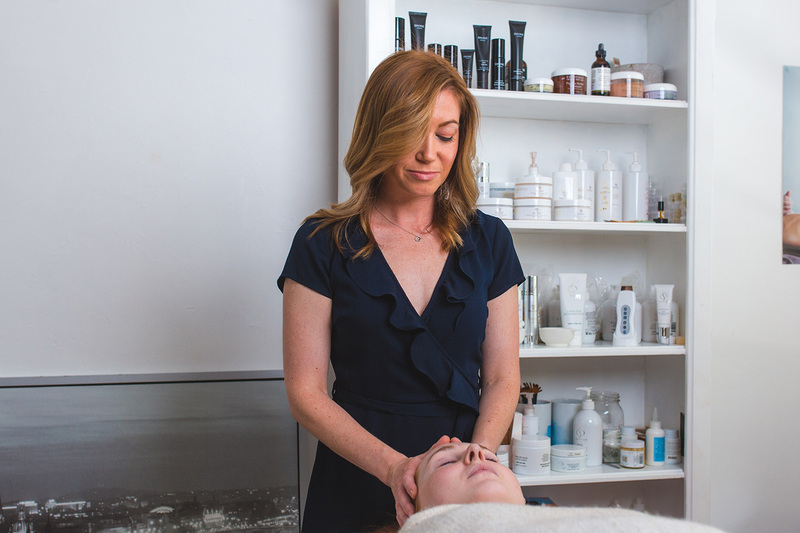 As a skin therapist who has worked in many large-scale salons, she’s seen it all — including the proliferation of quick-service and low-budget services, and the rise in demand for injectables, laser therapy and chemical-based peels. With an industry that is prone to trends, fuelled by the rise of social media influence, Belinda says she’s remained steadfast to her number one principle — all-natural products — and it’s bode well. Just 18 months ago, Belinda decided to take a leap of faith and start her own business to fill a gap in the market for all-natural salons that use organic products. Maintaining her motto that all skin treatments should be personal and bespoke to each individual, Belinda Hughes Beauty has managed to grow from a back-room operation to a full-service salon in South Yarra in just over a year. Along with adding staff, Belinda has also started retailing popular organic products in the salon and online. We caught up with her to find out a few of the secrets behind the rapid success of the business and what she uses to keep her salon running smoothly. How did your business journey begin? I have always worked with natural and organic beauty, so I was finding it difficult to work in larger salons that didn’t place the same value on quality organic products. I love facials and being in a salon environment, but natural beauty salons are still quite rare so my desire to open my own business (where I could work the way I like to work) was constantly growing. My values are strictly natural/organic — and high-quality services get my clients the results they’re after — so I felt quite unemployable in the traditional beauty salon. What was the biggest hurdle you faced when starting the business? When I first started out on my own, I was working in a space at the back of a pharmacy in South Yarra, but within a couple of months it ended up being closed down due to a plaza management reshuffle. At first, the daunting challenge of having to move my brand-new business seemed impossible, but it ended up being the best thing that could have happened because I then ended up on leafy Davis Avenue in South Yarra — a much better spot for a growing salon. Besides that, it’s been pretty smooth sailing. The brand offering has steadily grown — along with our client base. Of course, there’s the ongoing marketing headache of increasing awareness of your existence and getting good word of mouth out there, but that’s a common struggle for most new small businesses. Describe a typical working day in your salon. Most days are different, depending on what’s going on. We’ve been in full renovation mode for about eight weeks now, but typically I get in about an hour before any clients to do the usual set up and meet couriers and laundry services. Then we get into a day of facials (facials make up about 90 percent of my treatments), with some other beauty services usually thrown in the mix. I also manage our online orders and try to cater to any clients dropping in to pick up products, so that’s always a juggling act around appointments. As the owner-operator, I tend to spend more of my time organising and completing the business admin, so I’ve hired another therapist to help with clients. What business tools and technology have you adopted to help you grow the business? We’ve built our own website and e-commerce platform so that clients can book online, order gift vouchers and buy products. Our focus is on making it as easy as possible for clients to book a treatment or purchase the products they love. In store we use Square for all of our transactions. It plugs into our iPad so it’s mobile and convenient for our clients to pay instantly after a treatment or buy some of the products we stock in the salon. Why did you start using Square? It was great to get up and running quickly, with a really simple sign-up process and no monthly fees like many other eftpos terminals have. Apart from pricing, we like the other plugins that you can use with Square, like the inventory management tool which allows us to track our product stock levels on our website and in our salon. What do you think has been the biggest contributing factor to the salon’s success so far? My ongoing obsession with all things natural beauty and the pursuit of achieving real results for my clients’ skin is my main driver and a key factor in our continued growth. Aside from passion, having a small-business family background definitely helped me with understanding what was involved in establishing a new business. That being said, I truly believe that if you’re passionate enough about something and care about how it will help others, people will be naturally drawn to that and you’ll succeed. What’s next for Belinda Hughes Beauty? More expansion and more brands! I truly am obsessed. My goal is to help as many people as possible find the correct skincare for their skin so they achieve the results they’re looking for. If the Belinda Hughes brand can be known as “the place to go” in natural and organic skincare, that would make me very happy. What advice do you have for other entrepreneurial people looking to start their own venture in the beauty industry? Most people who start their own business in beauty are already beauty professionals. I always strongly encourage therapists to find their own niche and passion. Find unique professional brands that excite you and do something a little bit different. Always make sure your online presence and technology are professional and up to date. Using technology not only makes booking and processing payments easier both online and in salon, clients also love that you’re easy to find and professional to deal with.